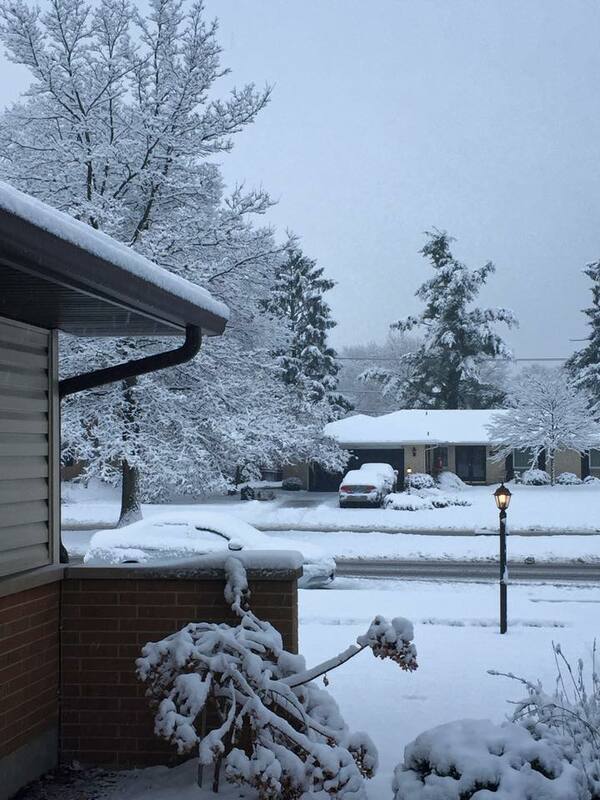 Chill December brings the sleet, Blazing fire, and Christmas treat. Winter is here! I would swear that I heard the actual “click” of that old Wheel turning into place. We had such a warm, long Autumn season and it was really lovely. But Winter is here in all her glory! It’s flurried snow a few times now but still no real accumulation. But it’s very cold, brisk, breezy, dark…all the things I love about this time of Year. My boots, sweaters, hats, coats and gloves are getting good use. Jammies go on as soon as it’s dark..and yes…that’s quite early lol. Candles are burning late into the nights and the woodsmoke hovers over the yard scenting my outdoor Moon-viewing jaunts so wonderfully! Something is almost always stewing on the stove or slow-cooker. Warm drinks are at hand always and I have to say that my Yule shopping and preparations are nearly done…..except for wrapping of course. I did my Yule cards as well and they’ll go out in the next day or two. Do you still do cards? I know so many don’t anymore. I get why, it’s a job, not that cheap, and many don’t reciprocate or send out at all. But for me, there’s something about doing them that just feels right. I do want to say a word before going on about my beloved Smoky Mountains. You all who read here or know me, know how much those mountains mean to me. They are my heart and soul…my home away from home….and watching the horrific fires tearing through them just broke my heart. The loss of of nature, human and animal lives and the loss of homes and businesses was just so overwhelming. I couldn’t stop crying. Too many lost loved ones. I’m just going to say that the damage could have been even worse as bad as it was already. I am heartened to see that many acres were not burnt and I know that Mother Earth heals Herself and the mountains will recover. Please think of donating to Dolly Parton’s My People Fund, or to the Friends of the Smoky Mountains. and Pray and light candles for those who lost so much. 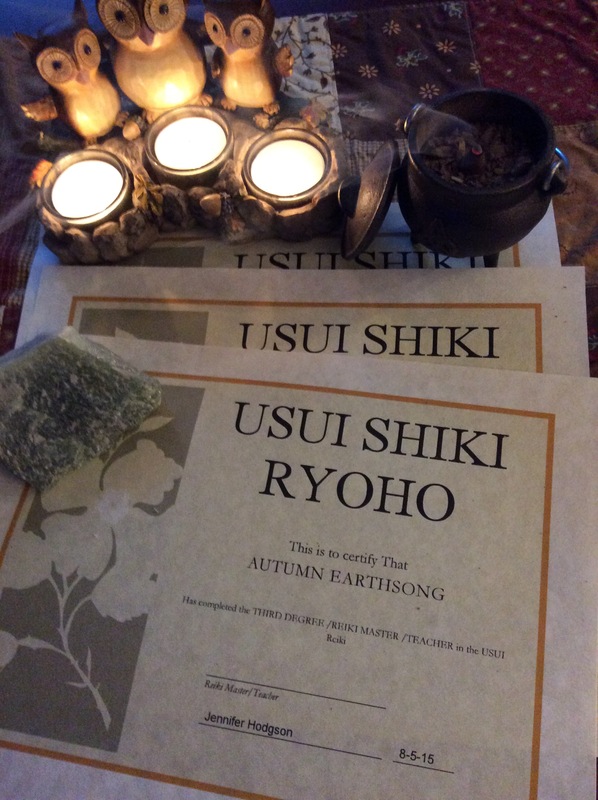 Thank you…..
Yule or Winter Solstice is coming fast and I relish it arriving. While the holidays are all about the hustle and bustle, Yule is a quiet time for me. And I always relish it and usually really need it! In recent years, my holiday shopping has been scaled down and I focus on a few quality things for each person in my family. But I DO have three wonderful grandchildren and have so much fun buying for them. But we do our best to focus on being together and appreciating those Hygge moments. Hygge….a Danish concept of coziness, joy, family, food and a complete sense of comfort and wellbeing. That is what my Yule is all about! It’s searching inward for that sense of joy and peace and comfort in the midst of what can be chaotic..Christmas. It’s looking back on your year and deciding what is kept or thrown out. Of what can be made better, or what can be cut out, what can be better done, and what didn’t get done at all that should have! It’s connecting with Mother Earth, Goddess and/or God. Of being still and listening. Very Hygge. If you aren’t familiar with the word Hygge. (pronounced Hoo gah) ..you should look it up and read about it. I did for a very good reason, as I had never seen or heard the word before! I recently had my DNA done and discovered to my great surprise that I’m very Scandinavian! I truly had no idea! 40% Scandinavian at that! The 39% British/Scottish/Irish I knew about and the 21% Southern Europe was a little surprising , but I really had NO IDEA I had so much Scandanavian blood in me. Who knew…I’m a Viking! lol. So of course, being me, I now have lots to learn. I have immediately ordered books from History, Lifestyle, Cooking and even Christmas books. While researching books I came across the word Hygge, looked it up and thought “well now, THAT explains my need to nest, be cozy, keep my home warm and pleasant and comfortable.” Apparantly it’s in my DNA! 🙂 I’ll talk more about this in future posts I’m sure. For now, Back to Yule….. I love to walk in the Winter. Bundling up against the cold, putting on my winter boots and mittens and off I go. Wish I could get more walks in but again, we make our choices and one of mine is to make time to do this more often! I love the bare, stark trees, the sounds of the birds and watching the ground critters digging for and burying food away for the Winter. I like to collect things along the way…..bits of greenery, pine cones, feathers, rocks etc etc. I have a big wooden bowl that holds my treasures when I get back home. Then coming home to a warm home, warm blankets, warm fire and warm drink…well it’s just Bliss! This is how I’ll spend my Winter Solstice night. Quiet, peaceful, contemplative and cozy. I’ll relish the longest night of the Year….and I’ll look forward to the return of the Sun and knowing the days will lengthen again. 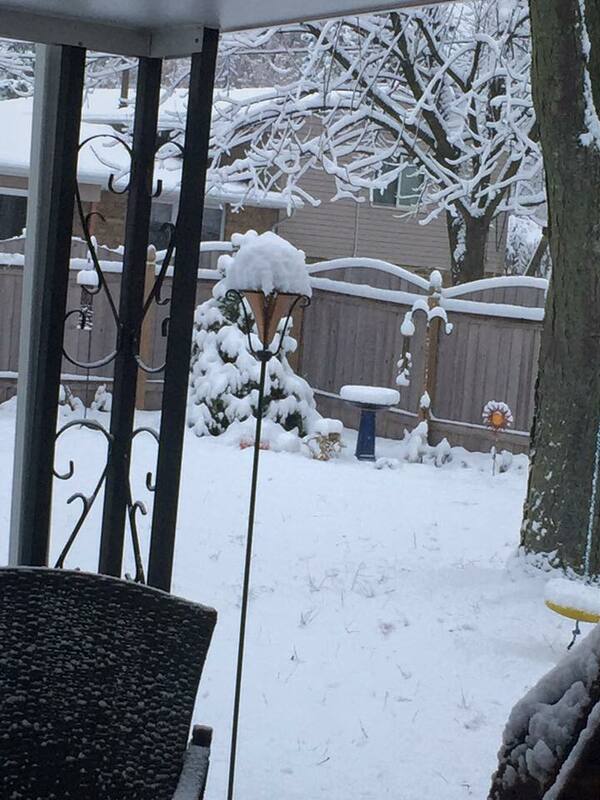 But not yet…we have lots of Winter to go…and for that I’m grateful!! I’ll be back soon with recipes and more. I suggest you enjoy the holidays..all parts of it you may celebrate. Keep it simple, happy, peaceful. It doesn’t have to be materialistic, chaotic, or even dare we say…awful! LOL. Make good choices, change things up, re-evaluate what traditions you love and discard those you don’t. And I will say, I know many families face challenges this time of year…. especially THIS year. The presidential election has been especially polarizing. I have seen friends and families torn apart by their differences. If this is the case..make the decision that you will embrace the differences and love them anyway OR keep your distance this year until things calm down. Perhaps a rule…no talk of politics when you’re together ? 🙂 Whatever works for you to stay positive and joyful is OKAY! Have a fabulous week and remember to take time for yourself! Merry Meet my friends! It’s a gorgeous Saturn day here in Ohio! 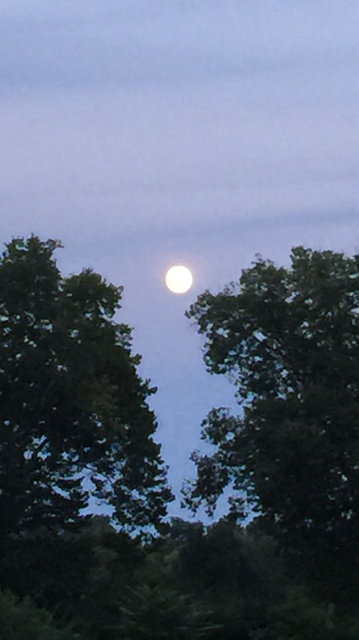 We’ve had a few beautiful days of cooler weather….50’s at night and 70’s during the day. This whole Summer has been fairly mild. Sure, we’ve had a few days that hit 90* or near it, but we’ve had good breezes and enough rain and though Summer isn’t my favorite Season, I’ve enjoyed it. I hope that you all had a wonderful Litha/Summer Solstice. I know I did. I was busy that day as we were leaving for the Smoky Mountains the next day, but I harvested my first harvest of herbs, worked in the gardens a bit, and had a simple Summer feast. I made offerings to the Fae, and welcomed the Sun on the longest day of the year! It was a beautiful Sabbat. Now, Summer! Everything here is still green and lush. 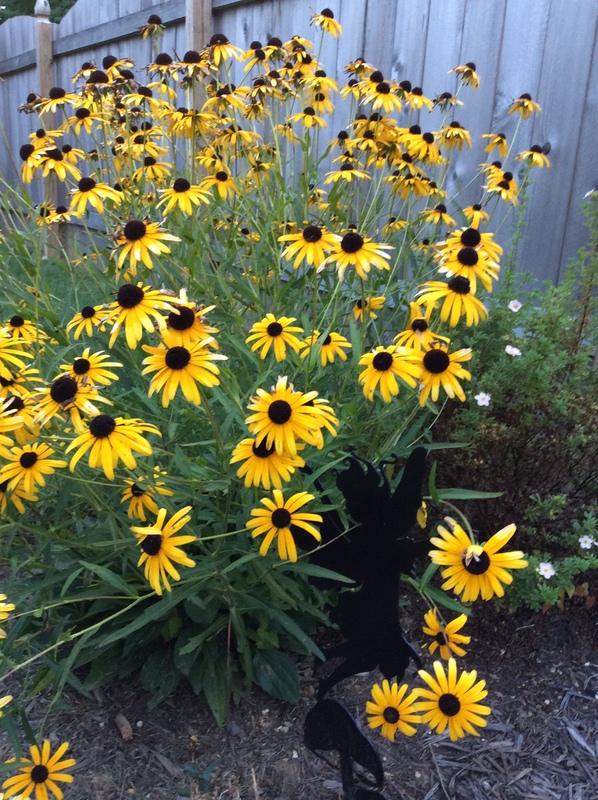 Gardens are blooming at full bloom, birds sing and critters scamper, the 4th of July was celebrated yesterday. Fireflies, butterflies, and bees are busy. I have so many fond memories of Summer when I was a kid. 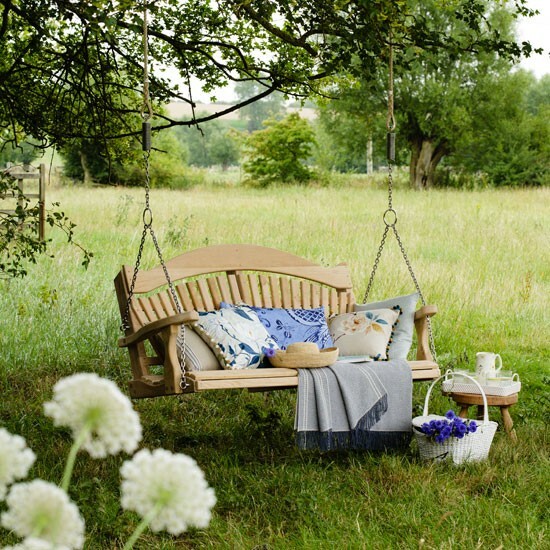 The adage….lazy, hazy, crazy days of Summer..was true then. I spent a lot of time playing with my friends in the neighborhood. Kickball games, tether ball, riding our bikes or roller skating, going on hikes in the woods near our homes, fishing at Old River (not allowed but we did it anyway). We only went home to eat or use the bathroom. In the evening, the parents would come out to their porches, talk together and keep an eye on us….and we got a holler when it was time to come home…or we came home at dusk like good children. There were day trips to visit parks, fairs, drive-in movies, picnics etc. Summer was truly a wonderful, memorable time. Every Summer I spent a week with my grandma and grandpa who had 10 acres of apple trees, gardens, hammocks and endless fun. I loved helping my grandmother snap beans and shell peas. 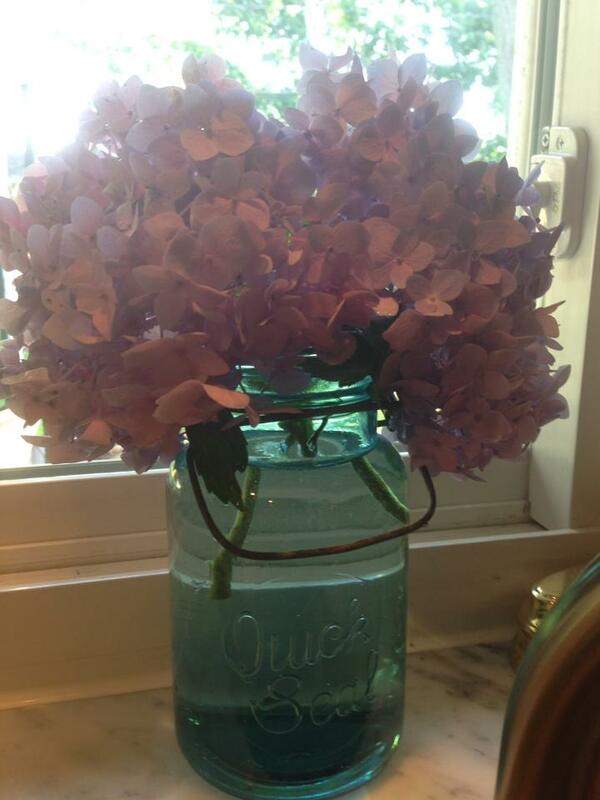 I helped her bring in good things from her gardens, washed them, canned them, sliced them…whatever help I could be. I give my grandmother full credit for my love of gardening and cooking. I learned at her side. There was time spent on hammocks with library books that she made sure I had an abundance of… by taking me to the library herself. There were 7 course meals..even for breakfast..mostly things from her garden. Early to bed and early to rise at her house. I still can conjure up in my mind, the amazing scents coming from her kitchen early in the morning, windows open to let in any breeze that came, mourning doves cooing and my sense of contentment when I was there at her home. I eagerly jumped out of bed to be with her…usually standing in her kitchen in housedress and apron, stirring something amazing on the stove 🙂 It was pure magick! I did my best to make those amazing kind of memories for my own daughters, and now I have the extreme pleasure of trying to do the same things for my own grandkids. I want them to have those memories of the lazy days of Summer. To know that Life can slow down in the Summer. Kids these days seem to constantly need to be doing something…they enroll in every sport, go to camps, take lessons, need trips to malls and movies, play dates, etc etc. There isn’t anything wrong with that..don’t get me wrong…but I think kids need to know how to entertain themselves, to slow down and be lazy, use their imagination…just BE! Get your kids close to Mother Earth…let them dig in the dirt..gardening or making mud pies. Lay blankets out on the ground and watch clouds drift by, or count stars at night under the Moon. Take them to the library and encourage their reading over the Summer. Plan simple picnics, outdoor day trips and if you have a drive-in theater near you! Go! Sprinklers, jars for fireflies or bugs, popsicles and s’mores, long walks in the woods, fishing….find things to do that don’t cost anything….teach them to find the simple pleasures of Summer. They’ll thank you for it later! Happy Sun day my friends! I hope that you are all having a wonderful Litha/Solstice weekend. I know I have been. 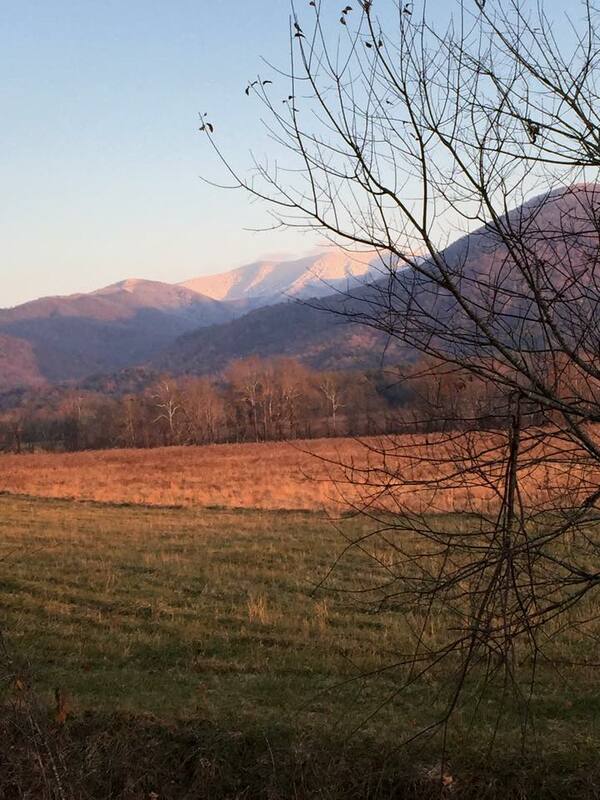 Today, as I said in my Wheel Turns to Litha blogpost, I am actually on my way to the beautiful, magickal Smoky Mountains for several days with all my family. 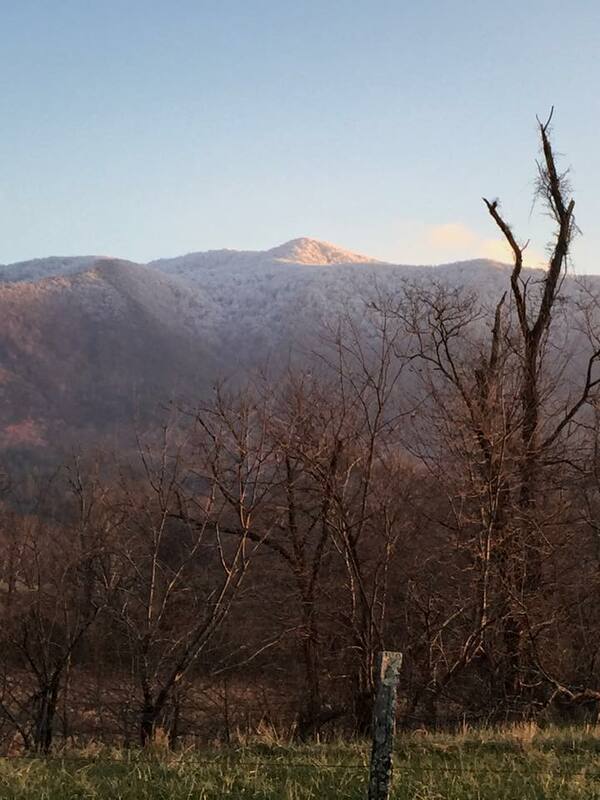 I’m so excited to be in the mountains again…it always feels like I’m going home when I go there! Today, this blogpost is again attached to my writing at The Sunday Stew. You will find a partial posting there and the entire post and info here. With my new blog look, just click on The Sunday Stew cauldron at the right here -> and it will take you straight to it. Also, if you want to print out this info for your BOS or herb book…you will see the link at the bottom of this post to do that. So here we go! While mint plants flourish all over the world, they are native to the Mediterranean and were spread by the Roman Empire. A Greek myth tells of an elderly couple taking the time to wipe down their table with mint leaves before serving a meal to traveling strangers. When the strangers revealed themselves as the Gods Zeus and Hermes, the couple was rewarded and the herb was then associated with hospitality! There is nothing nicer too, then visiting with friends over a nice cup of Peppermint tea. People have used Peppermint for thousands of years. The ancient Egyptians, Romans and Greeks added it to meat dishes and wine and utilized the leaves as a decoration for special occasions. Peppermint oil has antibacterial and antiseptic qualities. Herbalists prescribe Peppermint tea as a remedy for chest congestion, stomach troubles and headaches….and recommend Peppermint skin lotion as a pain reliever. Peppermint oil also enhances the fragrance of potpourri, cosmetics, shampoos, soaps and perfumes. Its leaves and oil add flavor to salads, desserts, teas, and sauces, as well as breath mints, chewing gum, toothpaste and mouthwash. For the best leaf production, mint should be planted in full to partial sunlight. 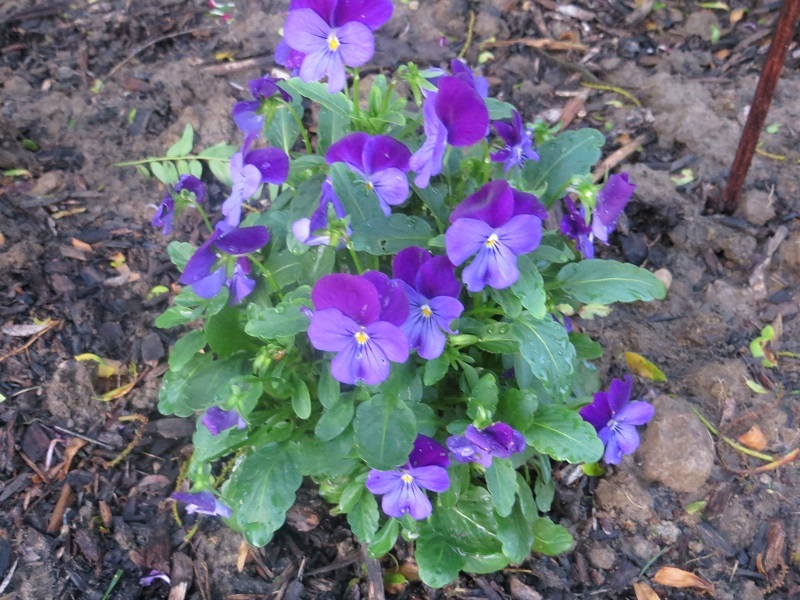 It will grow in most types of soil, but thrives best when it’s not constantly wet. The plants can be counted to reproduce on their own, but additional plants can be grown by stem and root cuttings. The mint plant is notorious for running rampant in gardens! Many gardeners choose to grow them in containers to prevent gardens from becoming nothing but dedicated mint beds! (So far, I’m controlling my mint ok….we’ll see what happens J) However, with containers, you have to be careful the pot is big enough so you don’t get root bound and the plant dies. That happened to me last year and I was so bummed! The spread can be kept to a manageable level by steadily harvesting the leaves of the plant. 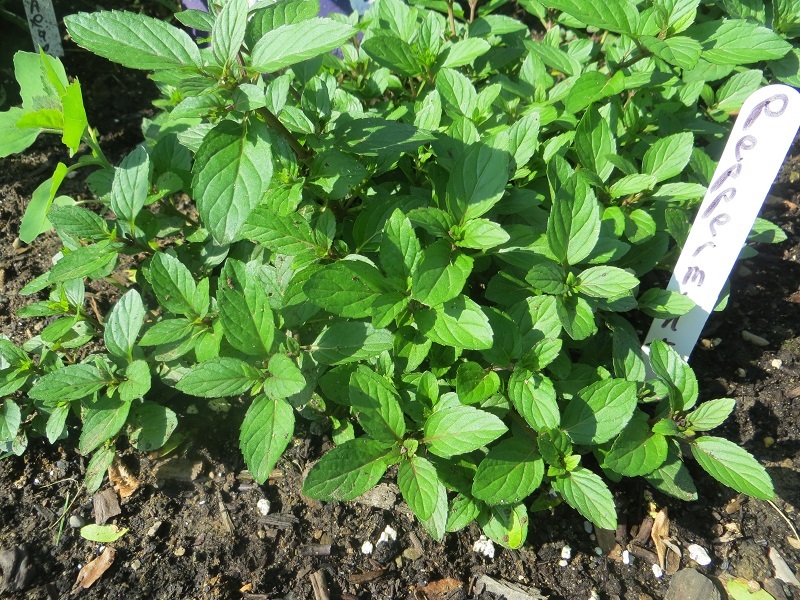 Peppermint plants grow to about 2 feet tall if allowed. Tiny oil glands in the leaves release volatile oils, giving the plants their wonderful fragrance. There is an amazing number of mint hybrids out there now. Peppermint and Spearmint are the two most traditional forms. Smooth-leaved peppermint has the most potent amount of menthol, while spearmint, with toothed and often curly leaves, has a sweeter flavor. Varieties with a hint of fruit flavor abound! Including apple, orange, pineapple, lemon, lime and even banana! 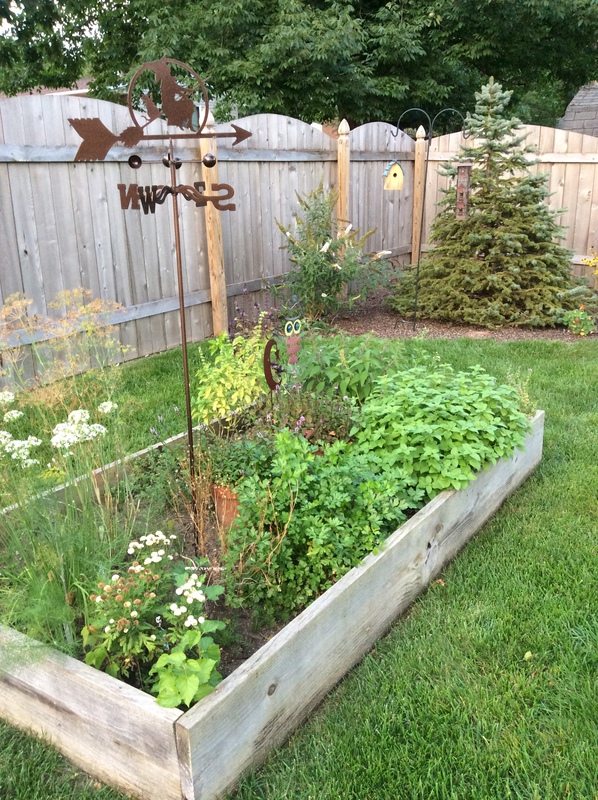 And yes, there is Chocolate mint….it’s growing in my garden and it’s wonderful! Then Spearmint, and then really wonderful Chocolate mint. The simplest way is to cut the stems down low on the plant….wrap a bunch of them together and hang them upside down to dry in a warm, dry place. I hang mine from hooks in my ceiling. 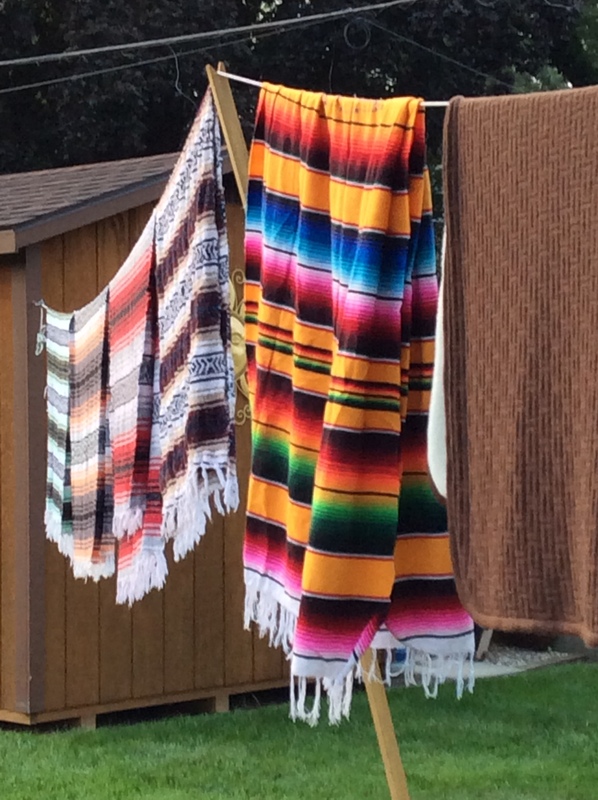 I’ve also used a peg board and a clothes drying rack. If the leaves are removed from the stem, just spread out on a clean metal screen, a tray, a basket and let them dry. You can also dry them in a low temp oven. Mint leaves can be added to mixed greens in a salad, can be candied or jellied, and can be made into a simple syrup. Mint is often used in sauces for lamb dishes and are a popular way to flavor peas. They can flavor homemade ice cream and granitas. One of my favorite ways to have mint is crushed into mint juleps or mojitos! They can also be made into wonderful herbed ice cubes that make tea, lemonade and just water so refreshing! Peppermint, in tea form, aids upset stomachs, flu and can be used to ease hiccups. Inhalation of the leaves in boiling water is recommended for head colds and asthma. Mint tea can be used instead of aspirin for headaches, especially menstrual –related headaches. Some headaches can be relieved if you lie down in a dark room with fresh peppermint leaves on the forehead or a bit of peppermint essential oil on your temples. (be careful your skin is ok with that first) Mint aids in respiratory and circulatory systems, it’s also an anti-inflammatory and an antiseptic. It’s ideal for treating indigestion, flatulence, varicose veins, skin irritations, rheumatism, toothache and general fatigue. I, for one, find Peppermint spray brings me out of the “lazies”. Peppermint oil can help to relieve earaches when a few drops are placed in the ear. The oil or a mesh bag of the leaves in your bath is wonderful when you have a cold or need to soothe your skin, or to re-energize yourself! Peppermint tea with honey soothes a sore throat. A few drops of the essential oil mixed with water and applied to a cloth, will help burning and itching skin, sunburn and relieve when you get overheated. As a lover of all things herbal, I love to add some peppermint, lemon and lavender essential oils to witch hazel…it makes a wonderful body/face spray to cool you too. Peppermint is a necessity in every Witch’s cupboard and garden bed! It’s in my top five!! Magickal attributes: Money, healing, strength, augments power, luck, travel, cleansing, consecration, dreams, happiness, love, passion, prosperity, protection, psychic development, purification, release, renewal, rest, sleep, animals, divination, endings, energy, exorcism, grieving, spirit offerings, success and transformation. -For a bath, place leaves in a mesh bag and hang under the running tap, or add a few drops of the oil to the water before you get in. -Grow it…for protection, prosperity, health, luck and abundance! 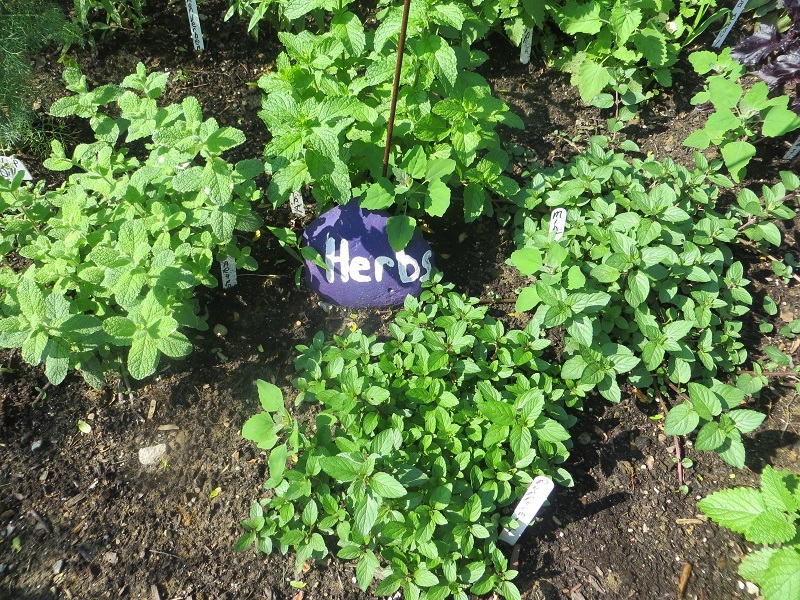 As I say…Every Witch should have Peppermint in her top 5 (my opinion) of herbs in her garden and cupboard. Oh and the essential oil too is a must!! Have a wonderful day and continue to have fun, to feast,to dance, and celebrate the longer days…the lazy, hazy crazy days of Summer!! The Wheel Turns to Litha..the Summer Solstice 2014.. This year, Litha will be a quiet, solitary celebration on the day. My Circle won’t meet til the following weekend. However, my family leaves for the Smoky Mountains the day after..the 22nd. To know I’ll be in my favorite Mountains for the Solstice is just…well…Magickal to me. I can’t wait!! When I travel, I carry a portable altar kit..mostly candles, incense, small crystals to bury, my pendulum, lavender oil, etc. Whatever strikes me I might want or need. Taking a walk into the Mountain woods, results in a bit of Magick for me! My soul just sings when I’m in those Mountains and the woods there. The Solstice is when I always put out new Witch’s protection bottles on my property, set up and re-fresh my wards and barriers, and make offerings to the Fae…though I do that ALL the time while gardening, I am always sure to do it again. Also, my herbs are usually ready for their first harvesting. That is one of my favorite things to do! 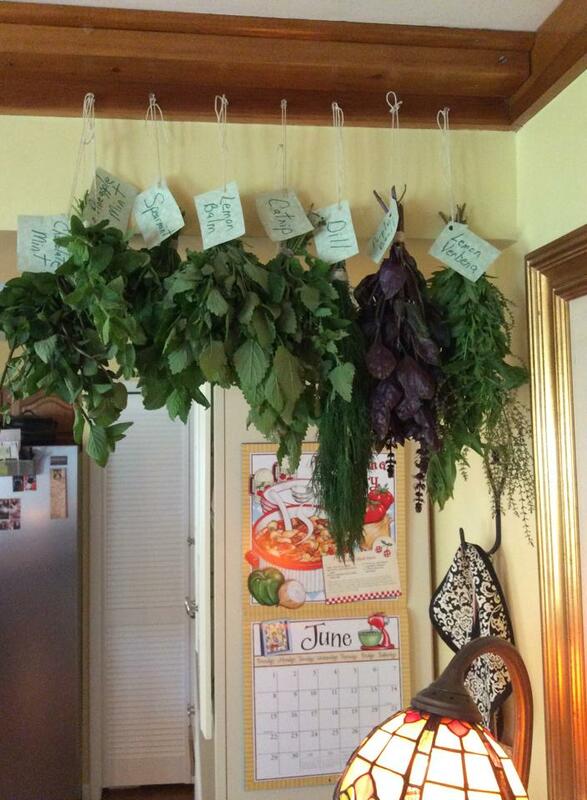 Smelling, touching, talking to, harvesting, tying and hanging my herbs just makes me so happy. AND I know most of them…will bloom again one or two more times before the end of the season. They are growing leaps and bounds in our wonderful weather. It’s not been too hot and we’ve had good amounts of rain, which is sooo much better then watering with a hose 🙂 It will be a good harvest! If you want information on how to do a Witch’s bottle..just type it into the search box on the right. It should come up with how I do it. Also, if you type in Litha and/or Summer Solstice..you will find previous years postings of recipes, correspondence and other info etc. I thought I’d share this recipe with you for now….it’s refreshing and uses healthy produce and herbs that are abundant this time of year! Whisk vinegar and olive oil in small bowl. Add basil and season with salt and pepper. 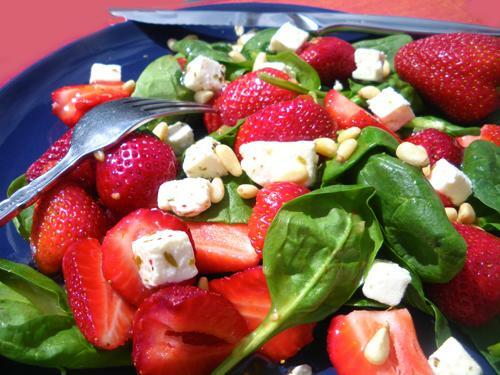 Combine spinach or romaine and strawberries in large bowl. Add vinaigrette; gently toss to evenly coat. This would be lovely with some crusty bread and a glass of wine..a perfect Solstice feast! However YOU celebrate the Solstice, I hope you have a beautiful, longest day of the year and enjoy every moment of it. Be lazy, be active, walk barefoot, swim, catch lightning bugs, eat watermelon, take a long walk in the cool woods…Connect and enjoy the Sun! I’ll be back again soon! Be sure to check out the Sunday Stew again (just click on the Sunday Stew Chef cauldron on the right column.) My recipe for Carmelite Water..using lemon balm will be posted. A great sipping drink to enjoy with medicinal value as well! Also lots of other great Solstice recipes and writings and info. Have a great week and leave me a message about YOUR Solstice plans..I’d love to hear!! It was June, and the world smelled of roses. The sunshine was like powdered gold over the grassy hillside.